The MasterCard-CrescentRating Global Muslim Travel Index (GMTI) 2015 is the first most comprehensive research that has ever been released on the Muslim travel market and uses in-depth data to explain how Muslim travel is impacting the worldwide travel market. 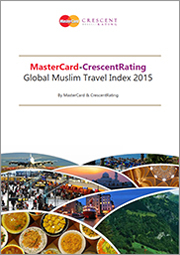 The “MasterCard-CrescentRating Global Muslim Travel Index (GMTI) 2015” is the most comprehensive research that has ever been released on the Muslim travel market . It looks at in-depth data covering 100 destinations across the world creating an overall Index, based on a number of criteria.